If you’ve previously installed this extension using instructions on this page, read this article to upgrade PHP extensions for Mavericks server. This entry was posted in Front Page, How-To, Technology and tagged Mac OS X, Mac OS X Server, MacPorts, PHP by Chris Brewer. Bookmark the permalink. Worked like a charm. 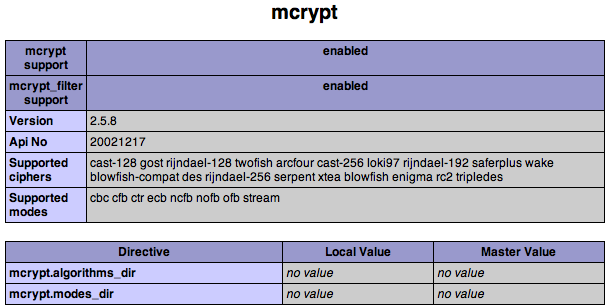 What’s great about this technique is that you retain the core Apache for OS X and use MacPorts’ build scripts to compile a platform-specific mcrypt without having to do much. If you ever want to undo anything, just remove the ports and the copied mcrypt.so and it’s like nothing ever happened. Highly suggest this method unless you really feel like you need to rebuild PHP manually. This worked for me, and was waaaaay easier than some of the other solutions I’d found on the ‘net. Error: Dependency ‘p5.12-locale-gettext’ not found. However, this also resolves the p5.12-locale-gettext problem, allowing the php5-mcrypt install to complete without errors. Beautiful. Been trying to install mcrypt with SL Server the whole day and had nothing but one issue after another trying to recompile. Nothing but errors, no matter where I turned. If only I’d found this earlier. Thanks for the post.